On a number of museum visits recently, I have noticed that although they appear flashy and exciting, I have very little inclination to sit or stand at a self-contained touchscreen exhibit. They are often big, shiny, with moving images and video content, they are immediately eye catching, but they do nothing to spark my imagination. There is no mystery in my mind as to why this is the case. It never used to be an issue; I have always been interested in trying out new and exciting forms of technology. But this is exactly the point; there is nothing new or exciting about touchscreens anymore. They are progressing to a point of omnipresence, with smartphones, tablets, TV’s and even ATM machines all utilizing the technology. A museum visit should be about experiencing extraordinary things, and touchscreens have become about as ordinary as a piece of technology can be. This is not to say that using touchscreens is no longer worthwhile, it just means that they can no longer be considered as effective exhibits in and of themselves. While a touchscreen 10 years ago was regarded as an exciting object and a valuable experience, they are now retiring into a role of operating simply as an advanced form of interpretation. Their value in this role is undeniable, the quantity and variety of forms of information that they can display, in intuitive and exciting ways is unrivalled at this point in time. But they need to be accompanied now by something unusual. Be that an object or an interactive element that involves a task unusual to everyday life, something has to fill the “extraordinary” void that touchscreens have now stepped out of. A fine example of this is at the Glasgow Science Centre’s recently re-opened Glasgow Tower. The Glasgow Tower is the world’s tallest freestanding, fully rotational tower, and it has a viewing deck at the top, a 105m high gallery that allows 360° panoramic views of the entire city. In this viewing gallery, the interpretation for the sights around you is contained within a series of iPad units, which display an interactive digital version of your view. You can then refer to these to zoom in on visible landmarks to find out what they are, and some information about them. These iPads are no different to the ones many people have at home, and the interpretation functions no differently to most map apps, but they are a valuable and rewarding interpretive method because they are an effective compliment to an extraordinary experience. Extraordinary does not have to mean spectacular though. Obviously standing atop Scotland’s tallest tower, taking in views of the entire city of Glasgow falls into both of these categories. But extraordinary in this case only requires something to be different from the norm. It does not even have to be an interactive experience; it could be something as simple as an archaeological find, a statue or a painting. 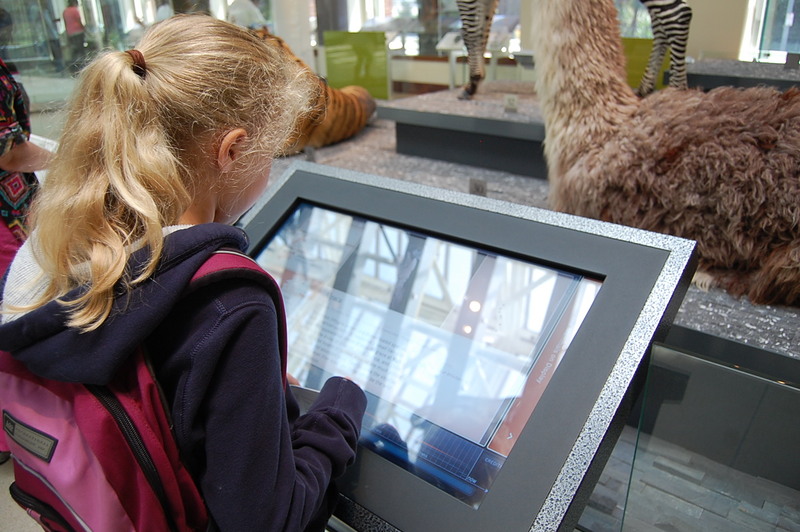 The National Museum of Scotland for example has several touchscreen interactives in its Connect gallery relating to the science and issues surrounding genetic cloning. The touchscreens themselves do not require any additional material to function as an exhibit, however the presence before them of the taxidermied remains of Dolly the Sheep, elevates an ordinary touchscreen experience, into an extraordinary experience. Dolly is arguably one of the worlds most famous cloning cases, so her presence (even indirectly) as a point of reference to the interpretive material, elevates the exhibit out of the ordinary. The trouble though, is that museums have had it good for quite some time due to the implicit value attributed to touchscreens and getting to use them. It is only a recent development that has seen them become such a prevalent part of our daily lives. Prior to the advent of touchscreen phones and tablets, the act of using touchscreen technology, especially the intuitive forms we are used to now, was still an exciting experience in its own right. Many museums have had these installed at great expense over the past decade, however the unfortunate truth, for me at least, is that they now need to touch base, and find ways to reinvigorate these exhibits by adding another dimension to them. This does not have to be costly and dramatic, the example of Dolly the Sheep proves that it can be something simple, static and intangible. All it has to be is something different from the norm. Museums now have to accept that not only are touchscreens now very much the norm, but they are fast becoming one of the most ordinary pieces of technology available to people. The time has come for institutions to get “in touch” with what makes an exciting, memorable experience, because for me, touchscreens on their own no longer, and will likely never again, provide this. I didn’t catch his name unfortunately; I had one eye on the thousands of butterflies in flight around me and one on a flight of my own that I later nearly missed. It wasn’t until I had, as requested, checked myself for tiny winged “stowaways” and settled myself and my thoughts in the fresh air outside the humid tent of the Natural History Museum’s Sensational Butterflies that I was able to fully appreciate the extent to which the gallery assistant (if you could call him that) had really elevated my experience. Sensational Butterflies is a temporary exhibition, housed in a large white tent on the east lawn of the London institution. Within the great tarpaulin flutters thousands of butterflies, beautiful, colourful and varied. The visitor enters through a large plastic curtain akin to those found on old supermarket fridges, and follow a short snaking path around a wonderfully arranged series of flowerbeds, all the while surrounded, always, by butterflies. It is a truly magical experience. The first sign you encounter as you enter the exhibition informs you not to use flash photography, not to stand on any of the specimens, and finally, not to panic if any of them land on you. They are harmless after all. I realised however when I had left the tent that this was the last thing I had read before the sign instructing me not to inadvertently steal any of the tiny fluttering exhibits on my way out. There had been information panels and other interpretation dotted around the tent, but I hadn’t managed to take in any of it. More often than not there was so much activity in the air around you that it was difficult to remain undistracted, occasionally the panels were even obscured by specimens who had camped out across the text for a poorly positioned rest. I’ll also freely admit that I am somewhat “squeamish” around insects (especially winged ones) so I occasionally found myself conflicted as to whether to turn the rotating interactive panels that were intended to reveal interpretive material for fear that something “scary” was resting on the reverse side. I now realise that it was with great fortuity that the exhibition was complimented by such affable, knowledgeable and enthusiastic floor staff. The individual I spoke with approached us completely unprompted, but was an incredibly welcome interjection. He was, entirely through his own merit, the most valuable piece of interpretation available to me. Whilst my eyes were distracted by the forever flickering of wings in my peripherals, I was able to fully focus my uninhibited ears on the information he was so convivially conveying to me. What I received was far more than an audible version of the text panels however. Instead, this was interpretation with personality, which in turn made my experience of the exhibition more personal. I was able to obtain the answers I wanted, received information I didn’t know I wanted, and was even able to broaden the scope of my visit by enquiring about some of the more exotic plant life on display, (including a fascinating discussion about the etymology of the Passion Flower), and about the National History Museum itself. Most remarkably of all, his infectious enthusiasm for his insect subjects alleviated me of my unnecessary anxieties and for the first time I felt comfortable within the beating wings of my surroundings. In the space of a five-minute conversation, he had achieved everything that good interpretation should. He had made the content relevant to me personally, made me feel comfortable within the exhibition and with my understanding of it, and had prompted me to further question and discuss what I had learned. Without the assistance of museum staff, interpretive materials must regularly exploit multi-sensory materials in order to achieve these outcomes (not all do yet, but they should). Human contact however is multi-sensory in its own right, and it struck me, amidst the endless butterfly ballet, that this “living interpretation” is not only best suited to living subject material, but it is the best asset any exhibition can have. Obviously, a world of museums where every front-of-house staff member knows everything there is to know about the collections and their relative subjects is a pipedream. Those who do have knowledge of this kind tend to work behind the scenes as curators, collection managers and directors. People do have interests though that can be exploited to positive ends. 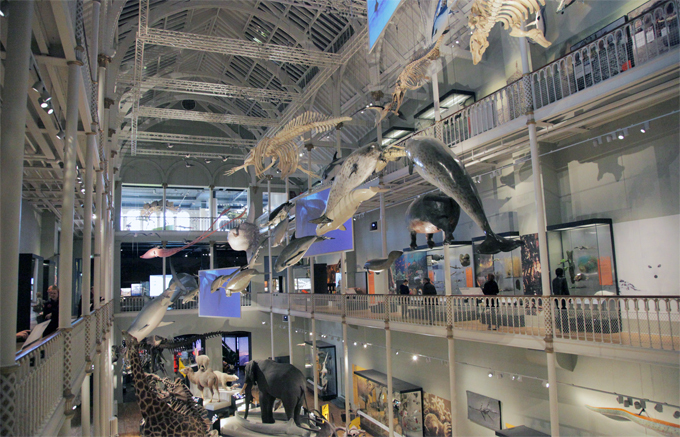 University museums are perfectly positioned to do just that, the Kings Museum in Aberdeen and Glasgow’s The Hunterian for example both use students from sympathetic disciplines to give tours of different aspects of their collections. At the latter for example, students who study or take interest in Art History show visitors around the Art Gallery, while those of an archaeological bent give talks on the Antonine Wall display in the museum. This is a hugely effective process as, especially in the case of the Antonine Wall, many of the students have studied the subject directly, meaning they have a deeper pool of knowledge than any object label ever could, and the visitor can choose to dive as far into it as they desire. These initiatives only work in the form of short tours however, as you cannot expect students to work the museum floor all day unpaid. For larger institutions though, they should encourage their paid staff to take a more active role in exhibitions. The duty of the museum should be to investigate who the people are who are representing them, find out what they know about, and what they are interested in and encourage them to follow these up. The staff should then be made to feel comfortable and confident enough to develop a willingness to share their knowledge and expertise with the visitor. 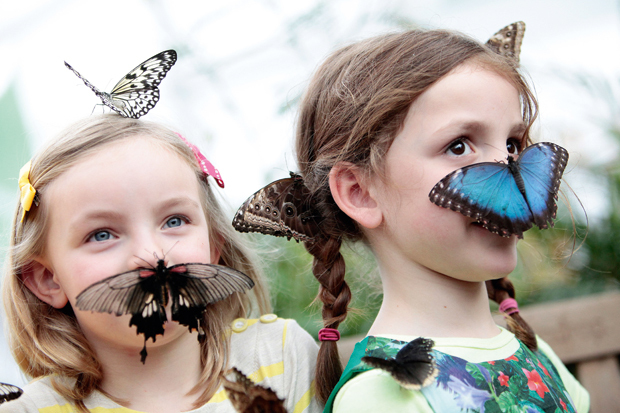 They do not need to know everything about every thing, but a deeper, more engaging understanding of a few exhibits each, will every now and again, provide someone with a more a personal, memorable museum experience, as was the case with my trip to Sensational Butterflies. The essential element here is that the information provided by the staff stems from genuine interest. Handing out scripts or asking guides to play different characters, fictionalises their role, depersonalising them, and in turn, your experience. Museums are full of extraordinary things, but they are real things, and they should be communicated to the world by real people, with a real interest in them. This is what I found at the National History Museum. The passion that exuded from the staff member I conversed with elevated every aspect of my visit, and an exhibition that at one point threatened to flutter past me, is now an important and affectionate memory. This week my attention was drawn to an article written by Stephen Bitgood, a leading psychology professor at Jacksonville State University. In it, he discusses the orientation of casinos, and their deliberate attempts to disorientate their visitors in order to make them spend more time and money in them. He then compares the layout of museums and criticizes them, namely the Metropolitan Museum of Art, for being so similar, instead heaping praise on the North Carolina Museum of Natural History for its simple geometric design and its easy, “shopping area” navigability. But is there really anything wrong with getting lost in a museum? Obviously I am not advocating a funhouse museum filled with trapdoors, moving walls and those stairs that turn into slides that Scooby Do always falls foul of. But a non-linear orientation that allows the visitor to carve out their own narrative by twisting and turning through an intricate, yet natural web of exhibits will greatly elevate their experience. Neat, functional grids are ordinary, and a museum should be an extraordinary experience. Cities use grids because they make navigation simple for the people who live there, and point A and point B can be connected as quickly as possible. However the winding streets of Edinburgh’s old town provide visitors to the city with a far richer adventure than the endlessly repeating blocks of Glasgow city centre. Yes they may be frustrating for those who live there, but nobody lives in a museum. At the museum everyone is “just visiting,” and the purpose of this visit is to explore an interesting, out of the ordinary, environment, and they mostly want to take their time in doing so. A museum should lift people out of the city anyway, elevating them above the sights and sounds of everyday life. Old museum building deliberately used to do this, that’s why they all had staircases leading up to the front door. When Frederick Law Olmstead and Calvert Vaux designed New York’s Central Park in 1857, they deliberately did so without the use of straight lines. There are few straight paths and right angles in nature. Central Park was intended to transport the visitor out of the city and back into nature, to the much idyllicised American wilderness (you couldn’t even see the buildings through the trees back then). A museum should do the same thing; it should elevate its visitors out of the ordinary, into the out-of-ordinary. The visitors should not be afraid to immerse themselves in the museum. Bitgood talks of how casinos mask their exits from the customers view, but you don’t need to always be in view of the door at a museum either. As long as it’s signposted properly it doesn’t matter whether you can see it or not. A museum has bigger problems if its visitors are constantly ensuring they have a visible escape route. A visitor should never be concerned with leaving, only with what they will discover next. Bitgood is also critical of the over-prevalence of what he refers to as “choicepoints” in casinos. Their purpose in such establishments is to disorientate the visitor, preventing them from mentally mapping their surroundings and forcing them to spend longer on the casino floor, even when they are trying to leave. In a museum however, “choicepoints” are wonderful things. They help personalise the visitor’s experience, and create equilibrium within galleries, with people constantly weaving in different directions, following their own narrative paths. This weekend I visited London’s Natural History Museum where they have in recent years refurbished their Volcanoes and Earthquakes exhibition. It is however, presented within a long corridor space, with displays down each wall and intermittently in the centre. The effect here is that you are confronted with two narrow channels and never more than two “choicepoints,” to go straight on, or to attempt to “slalom” between both. Granted it was an unusually busy day, but what I witnessed was that people, intentionally or otherwise, chose the former, tending to stick to a single channel, drifting through the exhibition within the stiff current of visitors. This for me is a gallery that would benefit greatly from allowing its visitors to snake, like lava, into the cracks and crevices of a more open, less linear environment, accentuating the unpredictable nature of its subject matter. I do appreciate though that space is not always a given luxury, especially in older buildings such as that of the Natural History Museum, and even there my volcanic grievances were not perpetuated throughout. In the limited time available to me I visited the Creepy Crawley exhibition, a large gallery space split into four zones that the visitor can slink and sneak in and out of at their leisure, and stood in awe beneath the Diplodocus in Hintze Hall, where I could see objects and exhibits up on the balconies, down grand hallways and looming from behind the cathedral-like columns. It was overwhelming, it was disorientating, and it was amazing. In order to send the visitor on an adventure, the museum must encourage them to explore. The Museum of Scotland Building, at the National Museum of Scotland, built in 1999 is very good at this. Everywhere you look there are small holes in the walls, revealing snippets of things to discover in other rooms. Sometimes you can even see through staircases to exhibitions on other floors and there is very rarely a clear line of sight to the bottom of a corridor. The St Mungo’s Museum of Religious Art and Life in Glasgow too, contains wonderful little architectural features that allow the visitor to see through “peep-holes” in the walls behind display cases, giving tiny glimpses of objects to seek out in adjacent rooms. In both of these museums the visitor is enticed, constantly by teasing sightings of further treasures for them to discover, and encouraged to seek their own pathways to them. The reason Stephen Bitgood has found so many museums with casino-esque orientation is because, for me, they are better for it. The museum of course is not intentionally trying to trap its visitors, waypoints and exits will always be clearly signposted, but the visitor should be encouraged, just for a while, to ignore these, to voluntarily lose themselves in the museum. The important difference a museum and a casino should have though, is that everyone who leaves a museum, should do so with their lives enriched. This week, Northampton Borough Council will place the ancient Egyptian Statue of Sekhemka on sale at Christie’s auction house in London where it is estimated that it could produce a fee of between £4-6 million. The council is attempting to justify the sale of the statue, which is part of the collection of Northampton Museum and Art Gallery, on the basis that the profits will go towards a proposed £14m extension for the institution. In a further twist, the council intends to share half of the proceeds of the sale with Lord Northampton, whose ancestors donated the statue to the museum. The intention of this blog will always be to embody a positive outlook on museum issues and I have no interest in handing out criticism unless it is productive and contextualized at the very least by some suggestions for change or improvement. However there is nothing positive to say about this situation, and the only idea I can or will advocate to alter this is for the planned sale to be scrapped. Northampton Council’s move to deaccession the statue has been roundly criticized, not least by the Egyptian Government and the Museums Association who are refusing to endorse the sale and threatening to revoke Northampton Museum and Gallery’s membership of their organization. My inability to find positives to address in this situation, and the fact that the issue of deaccessioning objects (or rather, not doing so) has been written about so extensively has left me hesitant to discuss this subject at all. I feel there is nothing more that I can, nor need contribute to the case against Northampton Borough Council’s plan, and the situation has been discussed and reported on a global scale already. However, it has got me thinking about another issue that is, for me, a little closer to home. For nearly 30 years, the residents of Leith in north Edinburgh have been campaigning the city council for the establishment of their own museum, which would chronicle the rich history of the area and highlight the achievements of some of its most famous sons and daughters (such as colourist J.D. Ferguson and novelist Irvine Welsh). 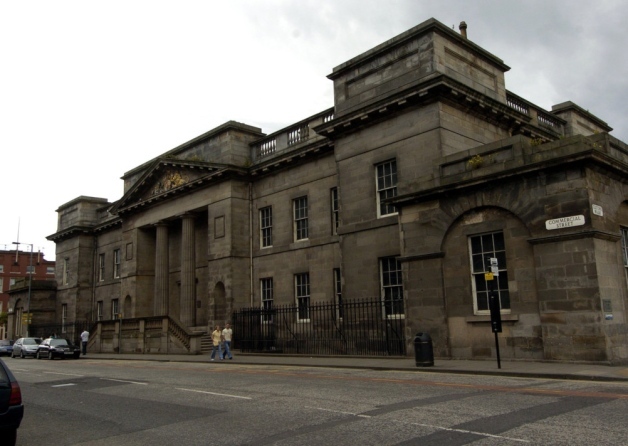 For around seven years now, councillors and campaigners have been in negotiations with the city’s National Museum of Scotland (NMS) over the procurement of the Leith Custom House (that the institution has been using for storage), to house the Leith Museum inside. 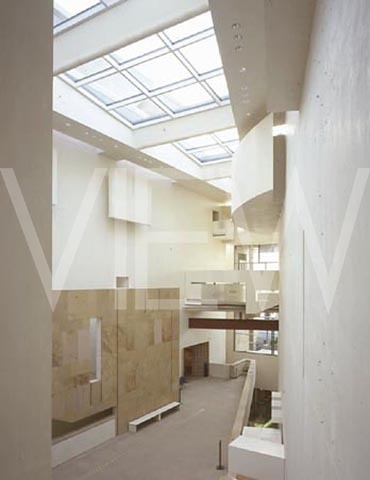 However, in recent weeks the NMS has revealed its intention to place the building on the open market. They are still providing the city council with first refusal on the building, and I understand negotiations are on-going to reduce the £600,000 asking price. Should these talks prove fruitless however, the building will potentially be sold into private hands. The Northampton Borough Council has been lambasted for its decision to sell the statue of Sekhemka, and rightly so, yet little has been made of the decision to place Leith Custom House on the market from outwith the Leith Museum campaign group. The issue here is that the building is being viewed simply as real property, rather than cultural property. The smorgasbord of architecture, statuary, public art and green spaces in Edinburgh has always made me consider it to be somewhat of a museum in itself. History pours from round the corners of every winding turn and forms the bricks and mortar of some of the worlds most beautiful buildings. The through-message during the media reportage of the tragic Glasgow School of Art fire this year was that the famed Mackintosh Building was, “a work of art in its own right,” and the building was considered as much a part of the school’s collection as the work displayed and stored inside. I have little doubt that the NMS feel the same way about their Royal Museum building on Chambers Street, which has over a century of shared history with both the city and the museum having been their home for over 120 years. What of Leith Custom House then? It has over two centuries of shared history with the city, and was designed by none other than Robert Reid, the same architect responsible for designing the façade of Parliament Square and the distinctively beautiful Edinburgh New Town. Reid’s buildings are etched into the face of the city, they are indicative of its aesthetic and its character, and the Leith Custom House is a shining example of them. The neo-classical Georgian property is clearly a historical artefact in its own right, it’s already a grade-A listed building, as are the Mackintosh and Royal Museum buildings. For their respective owners to sell them into private hands would be unthinkable, yet for some reason this logic does not apply to Leith Custom House. The sale of the statue of Sekhemka is reprehensible because a museum collection should be considered invaluable, and should never be considered in terms of its price, only for its historical, artistic and educational worth. It also deprives the public of a deeper understanding of their history by placing it into the hands of a private collector where it can no longer be freely studied and observed. Perhaps most importantly, a museum collection cannot risk the possibility of being viewed as a liquid asset. If Northampton Borough Council can sell objects to fund extensions to the museum, what then prevents people from calling for the sale of objects to fund struggling schools or hospitals? Where then do you draw a line? The sale damages the sanctity of museum donation and collections. Artefacts are given to museums by collectors in trust, for the benefit of the public, strictly for their aesthetic, historical and educational value. For an institution to profit financially from a donation directly contradicts this, and is presumably why Lord Northampton has demanded he receive half of the share from the sale of his ancestor’s bequeath. The aesthetic, historical and educational value of Leith Custom House to the people of Edinburgh is clear, the fact that the building too was a gift to the museum from Scottish ministers in 2001 makes the NMS desire to place it on the open market even more saddening. I am not so naïve that I believe all buildings can be treated in the same manner as other museum objects and I certainly do not believe that the museum should be expected to pay tax on and maintain a building they have no use for, solely out of an altruistic ethical concern. The new NMS storage facility in Granton has rendered the Leith Custom House surplus to their functional requirements, but I would encourage them to endeavour to reappropriate the building in a manner that befits its cultural value. For me, the “best value outcome” would be a Leith Museum in the Leith Custom House. The building’s historical, aesthetic and educational value vastly outweighs the financial; especially considering the building was a gift in the first place. If the Leith Museum campaign cannot acquire the necessary funds to put the project in motion then so be it, but I would urge the NMS to allow more time in order to give every chance of facilitating this particular, “best value outcome.” The motto on the Leith coat of arms reads simply, “Persevere,” and my message to the National Museum of Scotland, City of Edinburgh Council and the campaign for the Leith Museum is simply that, Persevere. From the 6th to the 29th of June this year, Somerset House was home to Amy Sharrocks’ Museum of Water. The exhibition was an art installation which saw the artist pool samples of water from the visiting public, and display them in the dripping, atmospheric subterranean corridors directly beneath the courtyard fountain of the famed London centre for art and culture. 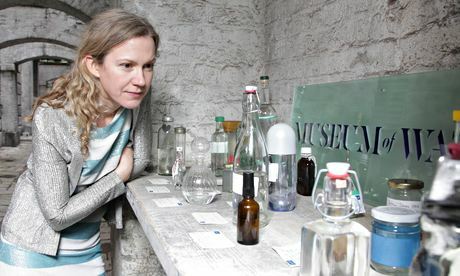 Sharrocks encouraged visitors to bottle up water, any water, bring it with them to Somerset House, and share the reasons or story behind their selection before donating it to the collection for display. The Museum of Water was a true community project. It was curated by the artist, but it was created by its audience. So what now? The Museum of Water has been packed up and it will not be re-exhibited until September, 4,000 miles away from the people who produced it, at the Vadehavs Festival in Denmark. The visiting public of London poured a little part of themselves into the museum, only to see it evaporate before them. I am a firm believer that all museums must make efforts to extend their offered experience. The audience must be treated not as just a visitor or a customer, but as a collective community, who can engage and interact with the museum even when they are not in the building. Most people cannot visit museums every day, but they can still be a part of them. This is especially true of the Museum of Water; its community are literally a part of it. It is not after all, an exhibition about water, it is an exhibition about people. So where then is the post-visit content? The museum is perfectly positioned to exist as an engaging online collection as much as it is a physical one. As a rule, bottles of water have limited visual spectacle. For those of us lucky enough it is nothing unusual either, it literally permeates everyday life. Of course, there are some unusual submissions, such as tears, toothpaste spit and breath condensation, but these too are familiar aspects of daily routine (not the tears, hopefully, but definitely the toothpaste, hopefully). Many of the bottles, jars and other receptacles containing the samples are admittedly interesting too, either for their aesthetics or their oddity. However the real content at the Museum of Water is unseen. It is the mind-set of the donor that is intriguing, the emotions, memories and feelings behind their selection. The visitor does not come to admire the water contained in these bottles, they come to discover the stories that are soaked through them. The Museum of Water’s website states that over 300 samples have been donated to the collection, of which 225 are available to view in an online gallery. One assumes this is an on-going process and the rest will be uploaded in time. I applaud the exhibition organisers for taking the time to do this, it is a hugely positive endeavour. However it is the stories, not the water that is the exhibitions strength, and these are largely absent from the gallery. At present it is still engaging, but it offers a teasing experience rather than a complete one. It would function perfectly as a pre-visit interaction, but there is currently nothing to then visit. The Museum of Water’s online resource should serve the community who helped create it. It should be an extension of their experience at Somerset House. The stories were obviously communicated by object labels and “Custodians” at the exhibition itself, but what of those that were submitted the following day, that yesterdays audience have missed? Visitors have watered the seeds of Amy Sharrocks’ idea, they should now be witness to what has grown from it. In fairness, there are some pictures in the online gallery that are accompanied by brief contextual statements or stories, but for the most part the images of the water donated are coupled only with descriptive text that produce a sea of questions and provide few answers. Where are the people beneath the surface of the Museum of Water? What was the reason for the tears, and why make something so personal, so public? Who submitted “water under the bridge” and is there more to it than an admittedly, quite clever pun? There’s surely more to “capsize water” than just a name? The Museum of Water is fascinating because it is a rare example of interpretation taking primacy over objects, so it has a unique platform upon which to build an engaging post-visit experience. I am under no illusion that nothing should or can take precedent over a physical museum visit, this is especially the case with Amy Sharrocks’ exhibition given that it is an art installation. But if said visit can be positively extended via post-visit engagement then it is essential that institutions endeavour to do so. The Museum of Water’s online collection is doing absolutely nothing wrong, it is merely missing a golden opportunity to do something really great. For the Museum of Water to disappear from London would be unnatural. Water does not disappear; a pool of water evaporates and returns to earth as rain, spread far and wide, touching entire communities. It will rain in Denmark in September, but it should continue to rain in London too, for it not to really would be unnatural. I used to hate it. Having grown up in Edinburgh I was in and out of the National Museum of Scotland (The Royal Museum back then) my entire life. When it reopened in 2011 following an extensive refurbishment, my first port of call were my undoubted childhood favourites, the animals and the dinosaurs. I was desperate to see how they had improved upon what an 8 year old me would have described as “un-improvable,” and I hated it. What I found was a “Wildlife Panorama,” with everything from fish, birds, mammals and dinosaurs all displayed as part of a single exhibit in the west wing of the old Victorian building. What on earth was this? Why was the tiger no longer positioned to be pouncing towards you from around a corner, where it would scare your parents half to death? Why was the Megatherium (Giant Ground Sloth), whose terrifying size had on countless occasions kept my younger self lying awake at night, been positioned in such close proximity to an elephant and a giraffe, who forced it into dimensional insignificance? Where was the blue whale? I was blinded by nostalgia. The inner child in me hadn’t been excited by the prospect of change, he hadn’t wanted change at all. In my stubbornness I failed to appreciate what an absolute wonder of modern exhibiting was placed before me, but not now. What I see now is a diaspora of wildlife, woven together on the floor or hung suspended from the ceiling, locked in a dramatic, never-ending chase. I see a wildlife display that is, genuinely, full of life. There are dinosaurs on show, millions and millions of years old and stripped to nothing but their time weathered bones, yet they feel as lively today as they ever presumably once were. The myriad of skeletons, taxidermy, casts and models are set firmly in place, yet this panorama exhibits an undeniable sense of motion. In the centre, hanging amongst the birds and sea creatures are three screen projections, showing videos of many different forms of wildlife in a variety of different habitats. They are bright and colourful, and their quick editing and fast-paced action immediately draw the eye of the visitor, and transfer an illusory sense of activity onto any object peripheral to them. Beneath them, the exhibits are arranged in a non-linear series of islands, causing the visitors to swirl and swell within the ever-changing tides of the gallery floor. Meanwhile, the balconies that form the first and second floors produce a set of concentric currents as visitors circle and admire the upper reaches of the sprawling display. There is a remarkable vibrancy within the panorama; this is far from just a room filled with dead animals. The exhibition is a truly multi-sensory experience. While it is clearly visually stunning, there is also a bounty of tangible exhibits and interactive material to engage with. On the first floor there is a feature that allows the visitor to view the panorama through the eyes of a chameleon or a dragonfly. Not only does this provide visual and tactile stimulation, but by casting the visitor in the role of an insect or reptile, they briefly afford an alternative, first-person learning experience, and these animals, too small to be featured amongst the panorama itself, are still represented in an important and worthwhile fashion. Sound too is everywhere and the panorama is as audibly alive as it is visually. Whether it’s the crashing waves, dramatic soundtracks and intense action playing on the video screens, or the banging, clanging and programmed sound effects of the interactive interpretation, the exhibition is scored by a ceaseless melody of activity. Most importantly of all, amongst all of this is the sound of people. Children are excited and adults are locked in conversation. Everywhere there is discussion, from the simplest “wow” of amazement to deep, informed discussion, visitors are talking all the time. For me, this is the most important element of any exhibition. If you can get people talking, you are doing it right. Visitors to the wildlife Panorama at the National Museum of Scotland are talking all the time, and this is by no means idle chatter; this is engagement, in its purest, most important form. You can lose hours in there. The moment the visitor walks in they become an archaeologist, excavating their own experience. Everywhere you look, there is something to discover. Whether you are on the ground with towering beasts above and beside you, or on a balcony peering across the chasm, through the ribs of a whale skeleton at objects glowing in a cabinet beyond, you are inclined, always, to explore. I will always hold my memories of the conventional displays of the old Royal Museum close to my heart, they are undoubtedly some of the primary reasons I have such a passion for museums today. But to say the new wildlife panorama that has replaced them is a positive change is truly an understatement. It is a breath-taking sight, and every one of those taken breaths, breathes yet more life into the exhibition. I love it.